This is a winning recipe for turning waste into worth! The conference will be held at the Graduate Minneapolis, 615 Washington Avenue SE, Minneapolis, on the University of Minnesota’s East Bank campus. The University of Minnesota is an urban campus. There is public parking on campus for a charge, but space is limited. Please visit the Parking and Transportation website for public parking maps and light rail information. The room reservation deadline has passed. 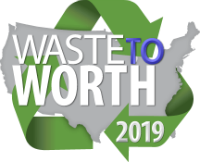 Please contact the hotel directly at 612-379-8888, press 1 for reservations, and ask for the Waste to Worth 2019 group rate to make your reservations.